A homeopathic preparation for treating teething and/or wakefulness of infants and other symptoms such as irritability and restlessness especially noticeable at night. Symptoms can usually be recognized when the child is being irritable and restless, especially at night.. The head feels warm. The mouth is hot. The child may also put his or her fingers in the mouth. For wakefulness -- Give 3 pellets of No. 3 before laying the child down to sleep. For infants it would be wise to dissolve the pellets in a teaspoon of water and let your baby slowly sip. The dosage may be repeated in an hour if necessary. For colic -- Give your child three pellets. Dosage may repeated in one-half hour. Consult physician if colic is not promptly relieved. 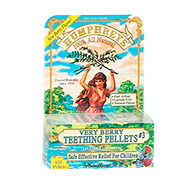 For teething -- Give your child three pellets of No. 3 every 2 hours until relieved. Teething of a child may usually be known by the child being irritable and restless - especially at night. The head feels warm, the mouth is hot. The child drools and puts finger in mouth, gums become swollen and reddened. Make sure crying is not due to other causes, such as bulky diapers, presence of pins or uncomfortable bed. If in doubt, it is best to consult your doctor. Very Berry #3 Teething - is shipped in a discrete, unmarked package. Orders are processed immediately and usually take about 3 to 5 working days to be received. We do ask that you try it for 2 to 3 weeks to feel the full effects. Any information received is used only for order processing and shipping purposes. Your information, such as e-mail address, will never be disclosed to a third party.